For those of you who didn't see Facebook, these were the road conditions on the return trip from Anchorage to Soldotna on Sunday, December 18th. First one (with partial view of the windshield wiper) was taken around Turnagain Arm just before reaching Girdwood (where we had intentions of stopping for pizza but the power was out). The second one was taken pulling out of Sunrise (where we enjoyed a bit of buffalo chili) in Cooper Landing by the Quartz Creek turnoff just before Kenai Lake. 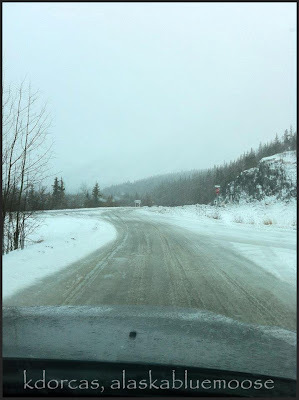 Yes, the weather improved in visibility; however, "white knuckle" Patti would agree that the patchy ice under the rain and snow (i.e., slush) necessitated caution, slower speed, and two hands on the wheel. LOL. We went slower than some for sure as drivers of a few bigger rigs seemed to think 65 was the speed limit no matter what the conditions. I would rather go 40mph at times than risk mine or others' lives; and, end up at the same stop light in town with them! I hate it when people go speeding by me on an icy road. It's very tiring when you have difficult driving conditions. Pleased you made it home safely. Brrrrr! Looks all too familiar to me, though this year I'm escaping it (hopefully!) on BC's south west coast. I drove this road the weekend before this one...Blowing sonw everywhere, at one point the road disappeared when snow blew down onto the car. It was pretty scary for about 8 seconds before we saw a glimpse of the road. 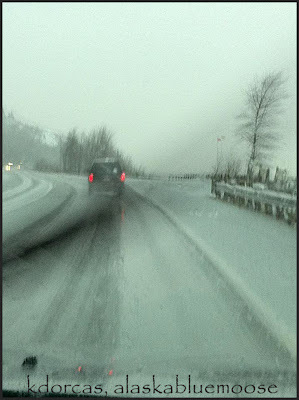 We should all get bravery awards for driving this road winter or summer!